In August I wrote about finding my oldest brother Robert’s grave in the Hart Cemetery. 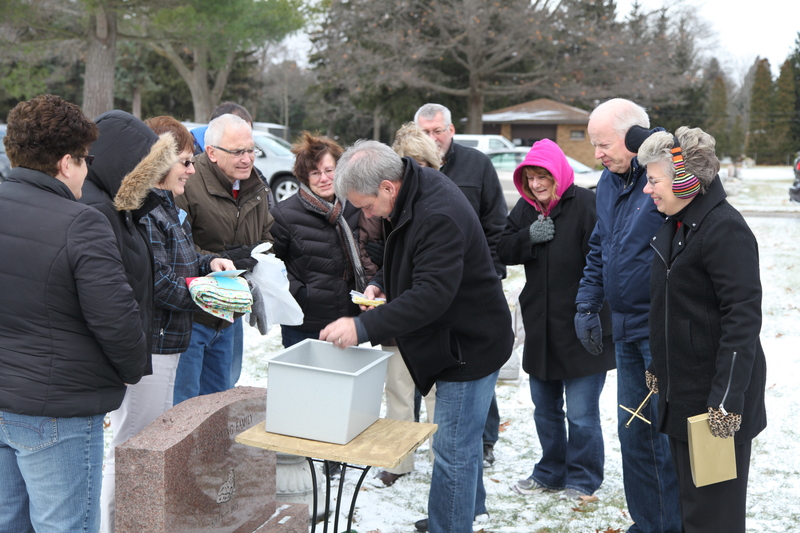 Shortly after telling my six siblings about finding Robert my brother Jim started devising a plan to reunite him with our parents in the Laketon Cemetery in Muskegon. 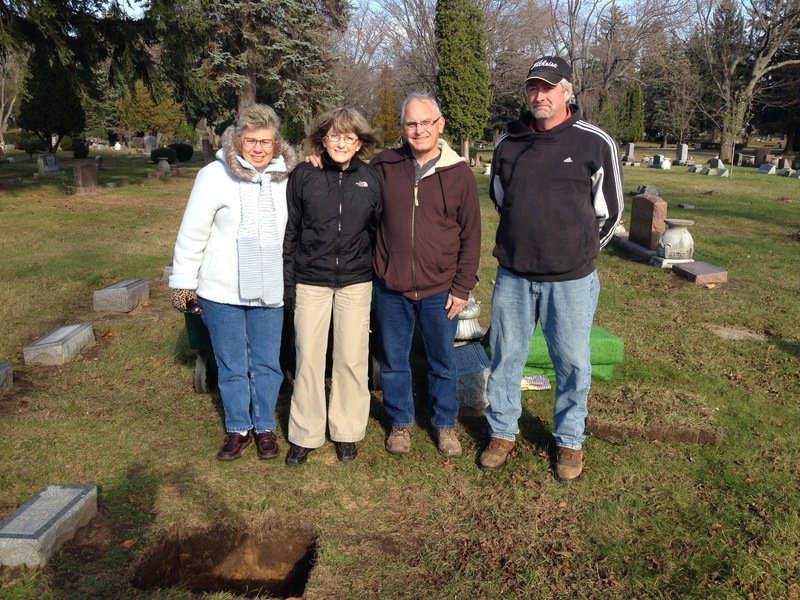 Last week Mark and I met Jim and his wife Janet at the Hart Cemetery to exhume some of the dirt in Robert’s grave. Robert’s wooden casket had deteriorated after 68 years so all that was left in his grave was dirt and some small pieces of wood from his casket. As a family we decided to keep a headstone at both cemeteries. John Wilson, the sexton at the Hart Cemetery, treats this cemetery as if he owns it. He knows where everyone is buried and is so respectful of its visitors. John takes great pride in making sure the grounds are beautifully groomed. 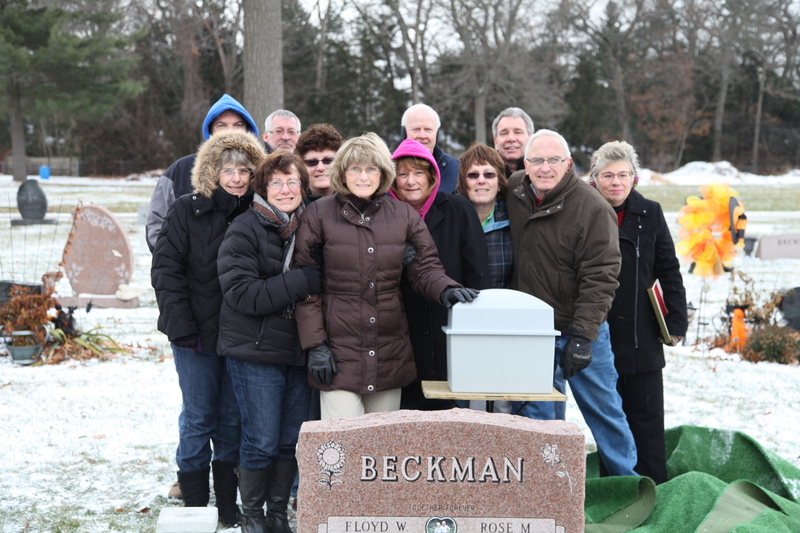 On Saturday, November 23, 2013, Robert’s 68th birthday, my siblings met at the Laketon Cemetery to celebrate Robert and bury him near my parents. 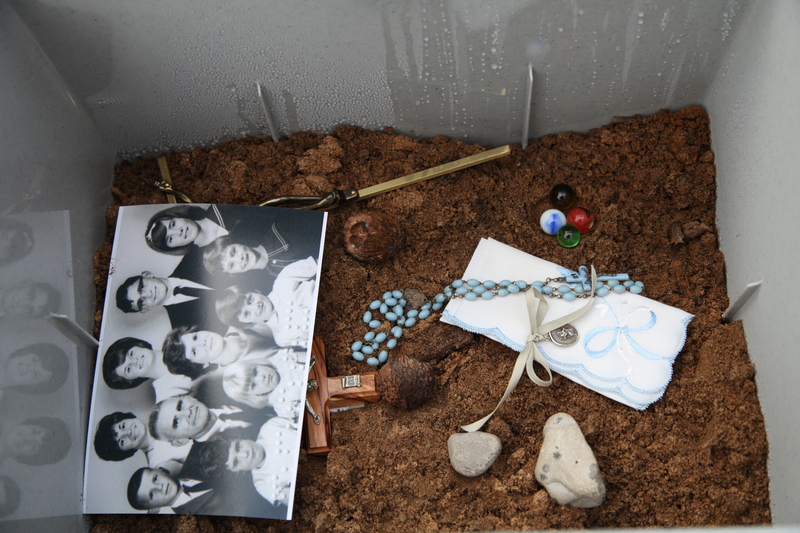 Before the burial we added a few special items to his burial box. Janet made a baby blanket for him and we all added a few of our own thoughtful treasures. After the burial we visited my brother Mick and my sister Jean who are both buried a few rows away. We ended Robert’s celebration at Jim and Janet’s house with a birthday cake. I can’t help but wonder who Robert resembled or what his personality would have been like. Just knowing he was a Beckman, helps me know he would have been a great person. Caring and loving like the rest of you. Glad their remains are all together. I know they are all together in heaven! I am sure Mick has been having great fun playing softball with his brother. Rosemary and Family… I didn’t know your brother Robert, but did know Mick.. When his name was mentioned, tears came to my eyes.. he was such a class act, I so enjoyed working with him and for many years didn’t catch the connection until one day. And I can’t even tell how the conversation came up.. But to say that I knew Mick and know Rosemary.. Your parents did well! This is beautiful. What a tribute to a family member long gone. May his soul rest in peace. Robert would have been a little like each one of the Beckman’s…..Special!! Hugs to all of you. Oh how sweet… They were all smiling in heaven last Saturday!